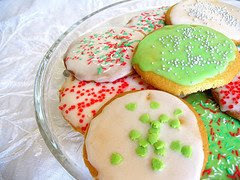 I would love to host a cookie/baked good swap in December. Invite a lot of friends to come and everyone bring a dozen freshly made goodies. Then everyone could swap them among the group for a wonderful assortment to take home. Sound fun? I do!! The mother of a classmate of my son's is having one and I think I will go! Of course, it is the Monday after a busy weekend (son't birthday and visiting out-of-state parents)!! I am enjoying your traditions. I am recently married and on the hunt to find things to incorporate into our new family traditions! So thank you for sharing these!! Fun! I wish I had time to bake some cookies! Fun!!! I wish I lived close to you b/c I would love to participate! Did you see the blog cookie swap that monogram chick hosted? I just mailed out my cookies and I'm hoping they don't arrive broken. What a great idea. The woman in my family are big into baking. This is something I may need to talk them into... Thanks for sharing.